I bought this arm from crust crawler+ Cm700 controller.. I attach Logitech c525 HD webcam..
Next I try to make a pan and tilt.. I try Pan using base motor and COG_X as a reference..
What is the best idea of pan and tilt system.. make the servo move and stop after reach the center of the screen? Or just make it stop after the servo reach the range of COG_X set? difference_x=0 to ----to----> loop while -10<difference_x<10 .........but roborealm hanging after compile!! left_motor=s1_pos-10 ----to---> left_motor=s1_pos++ .....but got syntax error?? all the example in roborealm didnt refer the present position...I think the example not suitable for dynamixe servo motor.. I hope that these script control programs could be useful in your experiments. I have read yourVBscript and the AVM tutorial.. How I can get in touch with u? like skype @ email @ blog? 1)What is the treshold value? is it depend on environmental? 2)For dynamixel servo motor, it rotate 0-1023.. where I should change in VB? 4) What is turret_v128 use for? Thank you in advance EDV..
>> 1) What is the threshold value? Is it depending on environmental? The value of "threshold" is number of pixels that provide "dead" area for servo motion control algorithm and it forces servo to stop motion when the hit to threshold interval is detected. The value of "threshold" depends on the input image resolution also on the speed of camera turning and on the camera FPS (usually 25fps). >> 2) For dynamical servo motor, it rotate 0-1023.. where I should change in VB? There are two variables of servo control separately for position of rotation TURRET_H_CONTROL and for controlling of speed TURRET_H_SPEED (it is variables for Pan servo control and TURRET_V_CONTROL, TURRET_V_SPEED for Tilt servo control). >> 4) What is turret_v128 use for? turret_v128 = turret_v + 128 => convert range to 0-255 for external variable "TURRET_V_128" of servo control . 1) How do you get -128 and 127 value? Is it the value from x and y coordinate.. what screen resolution you use? if dX > threshold and turret_h > -128 then 'How do you get -128 value? if dX < -threshold and turret_h < 127 then 'How do you get 127 value? And what are the variable I should sent to servo motor? >> 1) How do you get -128 and 127 value? Is it the value from x and y coordinate.. The servo control variable TURRET_H_128 has range from 0 to 255 with 128 being neutral and I decided to use more convenient range in auxiliary variable turret_h (external TURRET_H_CONTROL) that had range -128 to 127 with 0 being neutral. The value 255 is the maximum for control variable. So -128 and 127 are just half parts of this value. >> what screen resolution you use? The resolution 320x240 was used in this experiment. >> And what are the variable I should sent to servo motor? You should use TURRET_H_512 variable for servo control. As I mentioned earlier the value of "threshold" depends on the input image resolution also on the speed of camera turning and on the camera FPS (usually 25fps). In my experiment it was set to �threshold = 40� and for resolution 320x240 it give 12.5% of screen width. So you could set it to �threshold = 80� for resolution 640x480. I have alter ur 1st program (without speed) base on dynamixel and my mechanical structure, The robot can easily follow the object I draw on the paper.. the movement not so smooth.. I dont know how to tweak and fine tune to make it move smooth.. maybe your second program can make it work fine..
1)its easily follow the object I draw on the paper but it hard to follow an object such as pen, bottle cap.. How can I make it work? 2)If I remove the object I learn previous, and when I open it still in the list..
Turret_v , Turret_v_speed, Turret_h, Turret_h_speed? >> 1) Its easily follow the object I draw on the paper but it hard to follow an object such as pen, bottle cap.. How can I make it work? The AVM algorithm use only grayscale matching and it not allow to AVM see difference between green and red balls for example. So, good object for recognition with AVM should has appreciable texture. Also you should endeavor so that the object occupies as much as possible the square of interest area (red rectangle) during training because for AVM anything that was placed in interest area will become as object (background also). >> If an object goes out of view can the recognition box be stopped rather than carried over onto the out of range view... As I only have 1FPS then I would imagine that it would normally be dropped after 1/3 sec on a 30FPS cam.........but I am limited to 1FPS and it gets carried over for 15-20 frames. You should (temporarily before AVM update will be released) switch AVM Navigator from "Object recognition" to "Navigate mode" or [Object recognition] -> [Navigate mode] -> [Nova gate mode] and this action will set parameter ptTrackingDepth from 40 to 2 frames. The parameter "ptTrackingDepth" is the threshold value of the frame number in which the object was not found and then tracking will be stopped. The default is 40 frames (about 1.5 seconds) in "Object recognition" mode. I plan to add new variable "NV_TRACKING_DEPTH" in the next version of AVM Navigator that will provide direct setting of "ptTrackingDepth" parameter (from VBScript program for example). Also I noticed that your servos have a TOO MUCH speed and it cause to jerks of manipulator and dropping of object tracking. You should just to make servo speed slow down for good tracking. Just click "Set key image size (New)" button and answer "No" in the next dialog. Further set the key image size by hand on the camera view in AVM Navigator dialog window. Look attentively on "Key: <width>x<height>" green indicator below blue rectangle that shows key size. It would good to set 80x80 or 160x80 but not 80x40 or 40x40 key size. When you set key image size then your interest area for object training will stay oblong. >> 2) If I remove the object I learn previous, and when I open it still in the list.. The "Remove object" action can clear all visual data that was associated with chosen object in AVM search tree (if you want to correct previous bad training attempt) but can't remove his name from object's name table. But then you can try to learn this object once again. You can also continue to train on an existed object from object list (it writes additional data to AVM search tree) for new view angle (for example) in anytime. >> 3) For program no 2 (with speed), which variable I should send to my motor? is it: Turret_v , Turret_v_speed, Turret_h, Turret_h_speed? You should use TURRET_H_512 for Pan servo control and TURRET_V_512 for Tilt servo control and variables TURRET_H_SPEED, TURRET_V_SPEED for speed control (if it needed). And first try to just slow down your servo speed (now it too high). I noticed also that the value of horizontal and vertical rotation step is only 1 (turret_h = turret_h + 1, turret_v = turret_v + 1) however your servos have too big rotation angle for this amount. I think that you should decrease rotation angle amount in your Dynamixel controller settings in some way. I can set the min and max of rotation angle. What If I read the feedback of present servo position can make the calculation faster? Today I try latest Roborealm version that have usb2dynamixel module.. I have restart my PC, then I reinstall roborealm, disable antivirus but it still crash..
other module like RGB filter and COG working fine..
Just to be sure, can you download the latest and if that crashes send us/post the C:\RoboRealm.log file that is generated after a crash? That will help to quickly track down the problem. 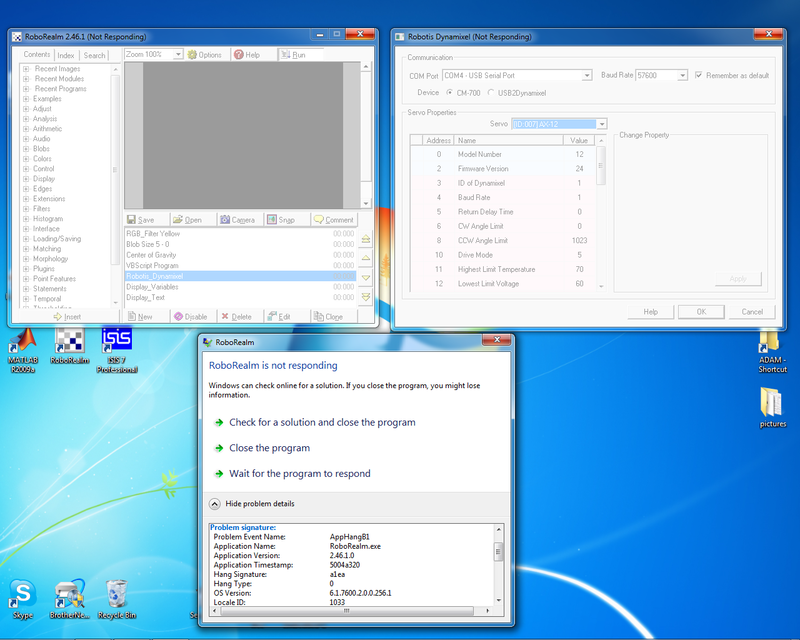 The program just terminate like in video and not ask permission to sent or create report/log.. It might be on your desktop. Be sure to have run RoboRealm as an Administrator to ensure it can write that file either on your c:\ or desktop. It is also possible that it is crashing outside of RoboRealm. Also, can you include the robofile just before you insert the dynamixel module as there may be some interaction from those modules that is causing the problem. We will also continue to test/investigate. I have upload my code detect yellow round. Actually I even I try to remove all module and only use dynamixel module (like in video)..
Hi, can the problem on cm-700 module be solve? I cannot find AVM Navigator module? old version have in the plugin menu, did AVM Navigator has change name? Yes, it can be solved. We have added additional error checking and reporting. Can you download the latest version, run the same module, crash and then rerun RoboRealm. It will bring up an interface asking to send us the crash report. Please allow for this to happen and we should receive more information. We have also made some fixes to the Robotis module so you may also not experience this crash anymore. Work fine on USB2Dynmamixel but crash when using CM-700.. I have run as admin and disable kapersky antivirus..
After crash and rerun Roborealm, there is no interface show up, asking for permission to sent crash report. We finally figured out the issue. Its not actually a crash but a deadlock that your machine was picking up on. Thus no crash file would have been generated ... your error just looks a lot like when a crash dump happens. This was problematic since we were not sure why no crash dump was happening and lead us off into a different direction. Regardless, we have seen your issue and uploaded a fix. Can you download 2.46.4 and try the cm700 mode?